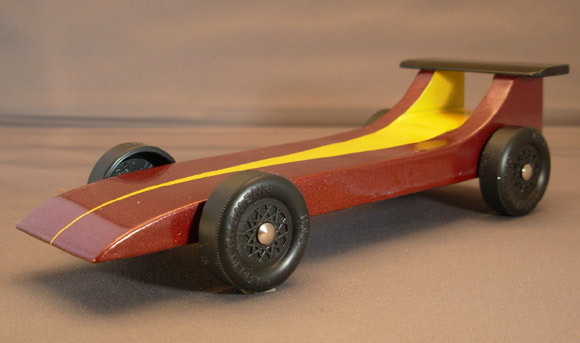 Everybody (at least anybody that has done any pinewood derby car research) knows that raising a front wheel (on a rear-weighted car will improve performance. This has been proven in many experiments, including one that we published back in 2005 (“Three-Wheeled Cars – Are They Faster?” – Volume 4, Issue 14 – April 6, 2005). But can this technique be taken to the next step; that is, can a car successfully run with two wheels off the ground, and does this improve performance? Certainly, this has been tried by quite a few people, many of which have sent me ideas for implementing such a car. So I decided to give this a shot, and try several two-wheeled car techniques. On a three-wheeled car, a front wheel can be lifted with success because the car is rear-weighted. Thus, the car sits firmly on the remaining three wheels (from geometry, only three points are required to define a plane). Three-wheeled cars are generally faster because one-fourth of the wheel inertia is eliminated (leading to faster starts). However, some of this wheel inertia savings is given back every time the raised wheel contacts the guide rail. Thus, a “rail-riding” technique is often employed to prevent the raised wheel from contacting the guide rail (the car is purposely aligned such that the front dominant wheel steers towards the guide rail). Applying principle one to a two-wheeled car, generally diagonally opposite wheels are lifted.1 But for the car to successfully balance on the two remaining wheels, the weight must be balanced symmetrically around an imaginary line connecting the center point of the two dominant wheels. This is easiest to do by center-weighting (placing the weight symmetrically about the center point of the car, but rear-weighting can also be accomplished by very careful weight placement (see Figure 1). In addition, for the car to rest without rocking back and forth, wider wheels must be used (no disc-type outlaw wheels). Regarding principle two, to eliminate raised wheel contact, both dominate wheels must be steered towards the guide rail. This excess contact may eliminate any advantage from the raised wheels. Thus, we will also try two additional options: 1) removing the raised wheels entirely, and 2) Replacement of the raised wheels with bushings (see Figure 2). Two bushings – These consist of bent ‘Awana’ axles (0.092 OD smooth axles) with filed down heads, and #4 Flanged Nylon Bushings (hardware store item). I lubricated the bushings with a drop of Krytox 100. The Pinewood Wizard body was initially set up to weigh 5.0 ounces with the wheels and axles, and the car was center-weighted. The axles were lightly polished and then lubed with Krytox 100. The wheels/axles were installed on the car (four wheels on the ground), and the axle heads were marked at the 12:00 o’clock position. The car was first run five times for lube break-in. Then five runs were made with each configuration. 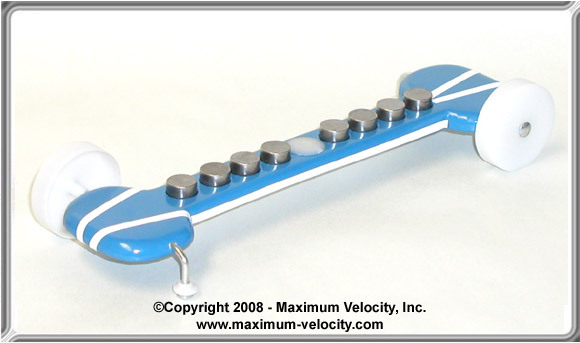 With each configuration change, the weight was adjusted as needed to maintain five ounces, and the alignment was adjusted to be optimized for each configuration. Four wheels on car, all on ground: center-weighted. Alignment dead- on. Four wheels on car, left-front wheel lifted: rear-weighted (center- weighting not possible). Alignment set to steer left. This is the baseline configuration, as it is the most commonly used. Four wheels on car, left-front and right-rear lifted: center-weighted. Alignment set to steer front-end left, and rear-end right (avoid contact with both raised wheels). Two wheels on car: center weighted. Alignment set to steer front-end left, and rear-end right (to keep the car on the track). Two wheels on car with bushings: Alignment set to slightly drift left (I tried dead-on, but achieved better performance with a left drift). Figure 3 shows the results of the test. The worst configuration was the four-wheeled car with two wheels lifted. I believe this was due to the alignment necessary to avoid raised wheel contact. The best performance was achieved with the two-wheeled car with bushing. I believe this was also due to alignment. Since minimal contact with the bushings was not overly detrimental, the near dead-on alignment produced good results. Note that all but one configuration was center-weighted. Using rear-weighting would likely improve performance for all of these configurations. If your race rules allow, running a two-wheeled car with bushings might prove to not only be a novelty, but also a possible winner. 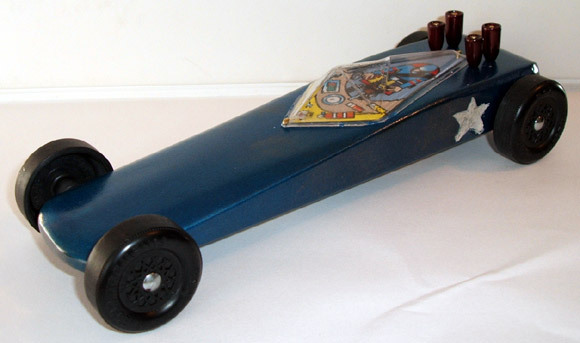 Also, for novelties sake, a two-wheeled car with no bushings would certainly be interesting. If you do build a two-wheeled car, please let me know how it turns out. 1A design does exist for lifting both wheels on one side of the car by counterbalancing the lifted wheels with a weight outrigger. This will be a topic for a future article. 2Previous to this experiment, I built a two-wheeled car with no bushings using the template in Figure 1 (I hadn’t thought of bushings at the time). I adjusted the alignment to prevent derailment, and tested it thoroughly on my aluminum track (which has a braking section which drops down). However, the actual competition track had a braking section which ramped up. When the car hit the braking section ramp, the angled body caused the car to immediately rotate clockwise. This resulted in the car hitting the end stop at an angle. The front of the car broke off, leaving me with just a few days to make another car. Figure 4 shows a photo of the car before it was sanded and painted – unfortunately I didn’t take a photo after it was painted.. I wrote this article during the summer of 2007. In March 2008, I decided to go with a two-wheeled car for our outlaw race on April 18. Having learned my lesson, I avoided the angled body design and went with a capital “I” design (Figure 5). It seems to track well and is quite fast. Since the race will occur after the last newsletter for the season, I’ll provide the results in a newsletter in the fall. 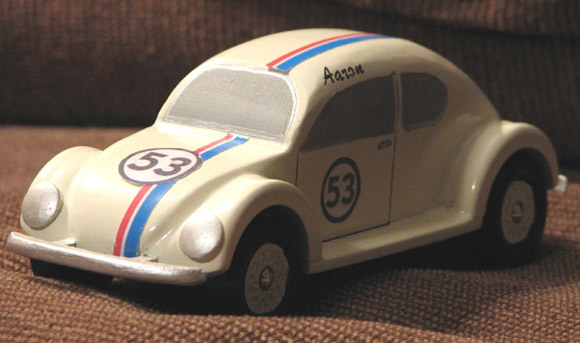 My son Aaron always liked the Disney movies that starred “Herbie the Love Bug”. So, we decided to make his pinewood car into a “Herbie”. We even duplicated the #53 and stripe decals to match the original. The car didn’t win many races, but it sure looked good going down the track. Best of all, we had a great time making it together and he proudly displays it on a shelf in his room. My son Hunter wanted a blue car with a white star. The red exhaust pipes are tungsten fishing weights and the body was a simple wedge. Hunter won Pack and District in 2007. He also set the track speed record for Districts! Thanks for all the info and tools that you provide. They really work! The idea for this car came from sprint cars that have high-mounted wings. The body is quite thin in order to eliminate drag. I build the cars as a hobby, as I am an adult and my son is now 23 years old. This car has been the fastest in several unofficial family/adult Cub Scout pack races that I’ve assisted with. I’m waiting for an adults-only race later this spring to really see how it does. My oldest son had the misfortune to be in a den with a scout that had two older brothers that had been through Scouts also. His dad had been helping with Pinewood Derby cars for 14 years. The best my son had done was third place in his den until his Webelos year. Here is what happened. My son and I decided to build the Stealth car from Maximum Velocity. Jeff worked hours polishing his axles, sanding the car and checking the weight. We tried every trick we had heard of. We lifted one wheel. We rolled it across the kitchen floor over and over until it rolled straight. We even used wax paste to polish the wheels. Then came race day. 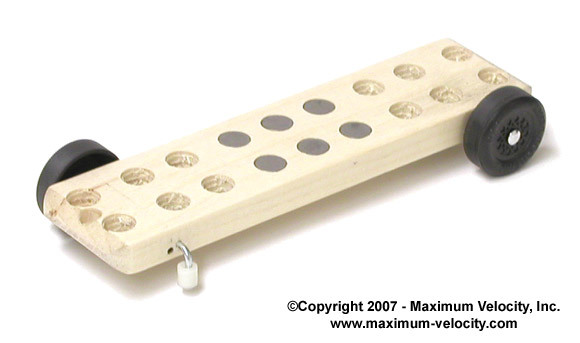 Our pack uses the double elimination method of racing on a three lane wooden track. They race in heats moving the cars to a different lane each heat. When Jeff’s den finally came up to race, I was on pins and needles to see how his car would do. He was in the first heat with the reigning pack champion. Jeff’s car won the first race, but then lost the next two races to lose his first heat. My heart sank when I saw his face fall, for I knew he was thinking it was going to be another losing year for him. We had to wait until the top racers went through to decide who was going to the final round. The final round includes the two fastest cars, and the third slot is filled with the winner of the consolation rounds. Jeff’s car was back up and I thought the best we could do now was third place again. Then something happened that I still cannot explain. Jeff’s car began to win. Race after race and heat after heat, his car was beating the other cars in his rank. Finally, he made it to the final round. Jeff, the pack champion, and one other car began to race. I couldn’t believe it when Jeff won the first race. These were the same cars that had beaten him in the very first heat. They moved the cars to different lanes and raced again. This time Jeff’s car came in second. It all came down to this last race. The crowd was chanting his name, “Jeffrey, Jeffrey” as the cars came down the track. The race was very close. If it wasn’t for the timer at the end of the track it would have been very hard to tell who had won. Jeffrey won! I couldn’t believe it, and I could tell from his stunned expression that he couldn’t believe it either. He had beaten the Pack Champion. Not only did he win First Place in the Webelos rank but he went on to win the race to become the new Pack Champion. I will never forget his stunned expression and that little come from behind car. Please let me know what devices are used at the end of the track to capture or slow the cars? Generally, there is a braking section that slows down the cars by causing the cars to slide on their “bellies”. Some tracks have a “Ramp Up” Section. Ours has just the painted wood surface, but adding some no-skid material would be better. We still put a pillow at the end, but the cars are going slow enough that they don’t bounce back. Due to the ramp up to the stopping section, cars can sometimes de-rail. A better solution is to have the Stopping Section Lower Than The Main Track. Finally, some tracks “capture” the cars in a padded “garage”. This method can damage the cars as they tend to enter the garage at a high rate of speed. All-in-all, I prefer the lowered stopping section with a no-skid material. This seems to slow the cars with minimal risk of damage. We were looking at the Pro-Outer Hub Shaver and the Pro-Axle Press II. Both tools indicate that they are not intended for Awana wheels. We really like the intent of both of these tools (especially the beveled axle head). Is there anybody that makes these tools so they can be used with Awana wheels? Sorry, there are no Awana versions for this tools. The Pro-Outer Hub Shaver was designed to clean off a flaw that is common on the outer hub of BSA wheels. Awana wheels don’t have this flaw, so the tool isn’t really needed. The Pro-Axle Press was designed for nail axles, as they tend to be bent and slightly out of round. 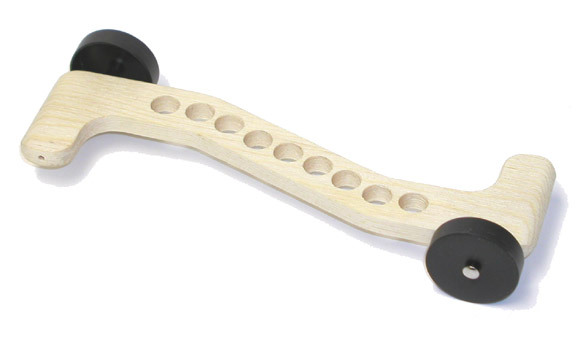 The Awana axle was made to be an axle, so it tends to be straight and round. The head beveling capability of the Pro-Axle Press can be used on Awana axles. However, the head of the Awana axle is quite thick, unlike the BSA nails which have thin edges. So the indent in the tool will readily flare back the BSA head. But the Awana head does not easily flare back, so you have to whack it quite a bit. This results in a thin head, which may or may not be desirable. With Awana axles, better results can usually be attained by mounting the axle in a drill, and then filing back the head with a small file. I would like to know how to take the nail and the wheel and insert it into the slot? When I try to do this, the point of the nail wants to stick out of the slot? When I tried to tap it in the wood splits. This is always a tricky part. First, it is best to prepare the slots before doing any work on the car. This opens up the slot and makes it easier for later insertion. You can prepare the slots by pre-drilling with a Pro-Body Tool or by pre-inserting axles with a Pro-Axle Guide. Then when the car is ready for axle insertion, the axles will follow the prepared slots. Using the Pro-Axle Guide at this point will simplify insertion and set the proper gap. If you don’t have these tools, and have not prepared the slots, then I recommend gently tapping a spare axle into a slot with a hammer. Then remove the axle with a pair of pliers (twist and pull). Repeat for the other three positions. Next insert each wheel/axle set into position. They should go in with much less force (no hammer needed or recommended) since the slot was opened up with the nail.